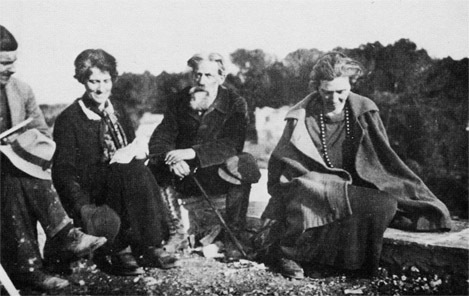 Farewell gathering for Patrick Geddes, Bombay's first Professor of Civics and Sociology, March 1923. He is standing fifth from left. Seated at left are Arthur Geddes and Gospal Advani (later secretary of the Scots College, Montpellier). 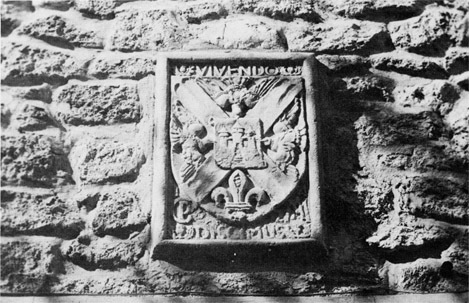 the first part of his Scots College dating from 1924-5.
on the front of the original tower building. 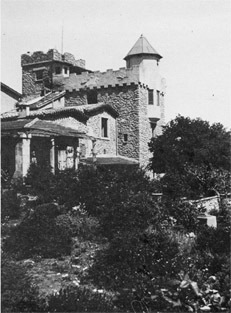 at the Scots College, February 1925. 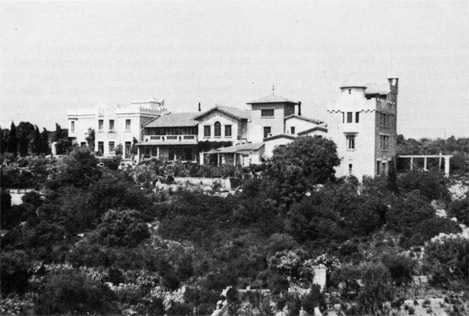 Omnibus to Assas, P.G. 's 'Chateau White Elephant'! 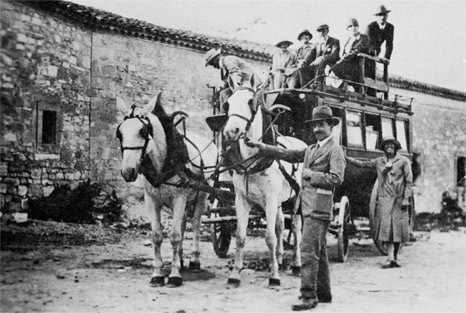 The happy purchaser on roof in middle, while Arthur Geddes holds the horses, and Mabel Barker stands beside the vehicle. Group of visitors on a conducted tour of Assas. 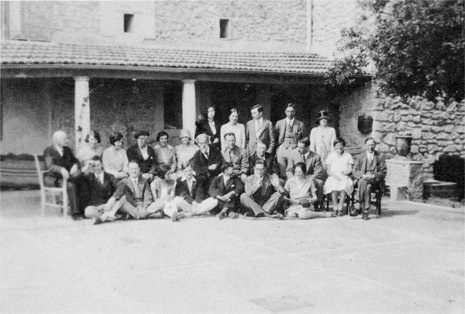 Back row left: Ahala Bose, wife of the Indian bio-physicist. 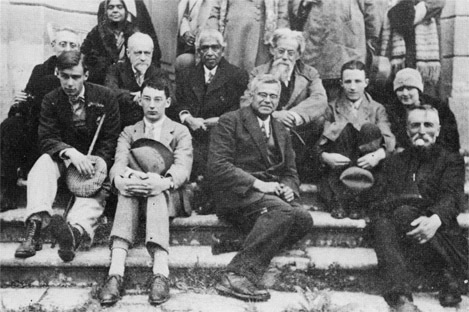 Second row, third from right, P.G., then Tagore's active man, Mr Mahanalobis then Victor Branford; front row, second from right: Sir J.C. Bose (May 1927). with the financial support of Lilian Geddes whom P.G. 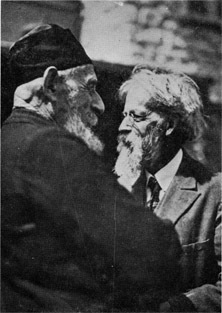 married in 1928 after eleven years as a windower. P.G. 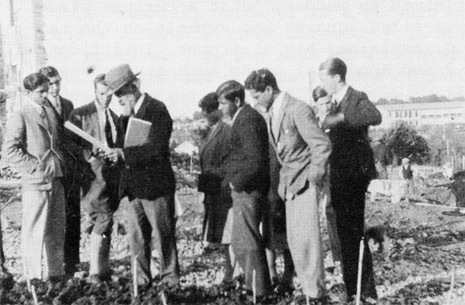 in one of the gardens with residents of the Scots College, Spring 1930. Indian College under construction in background. 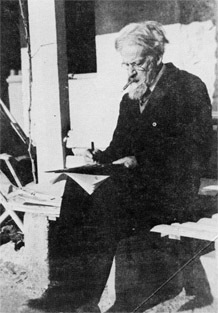 College des Ecossais, Easter 1930.
making a diagram while smoking one of the half cigarettes ordained by his doctor. P.G. 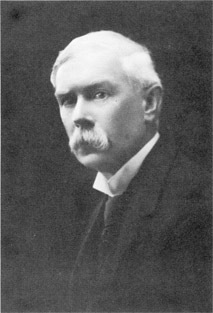 's pupil, friend and colleague of longest standing.